The CMP actuator assembly has an outer housing that is driven by an engine timing chain. Inside the assembly is a rotor with fixed vanes that is attached to the camshaft. Oil pressure that is applied to the fixed vanes will rotate a specific camshaft in relationship to the crankshaft. The movement of the intake camshafts will advance the intake valve timing. The movement of the exhaust camshafts will retard the exhaust valve timing. When oil pressure is applied to the return side of the vanes, the camshafts will return to 0 crankshaft degrees, or top dead center (TDC). The CMP actuator solenoid valve directs the oil flow that controls the camshaft movement. The ECM commands the CMP solenoid to move the solenoid plunger and spool valve until oil flows from the advance passage (11). Oil flowing thru the CMP actuator assembly from the CMP solenoid advance passage applies pressure to the advance side of the vanes in the CMP actuator assembly. When the camshaft position is retarded, the CMP actuator solenoid valve directs oil to flow into the CMP actuator assembly from the retard passage (3). The ECM can also command the CMP actuator solenoid valve to stop oil flow from both passages in order to hold the current camshaft position. The ECM operates the CMP actuator solenoid valve by pulse width modulation (PWM) of the solenoid coil. The higher the PWM duty cycle, the larger the change in camshaft timing. The CMP actuator assembly also contains a lock pin (14) that prevents movement between the outer housing and the rotor vane assembly. The lock pin is released by oil pressure before any movement in the CMP actuator assembly takes place. The ECM is continuously comparing CMP sensor inputs with CKP sensor input in order to monitor camshaft position and detect any system malfunctions. 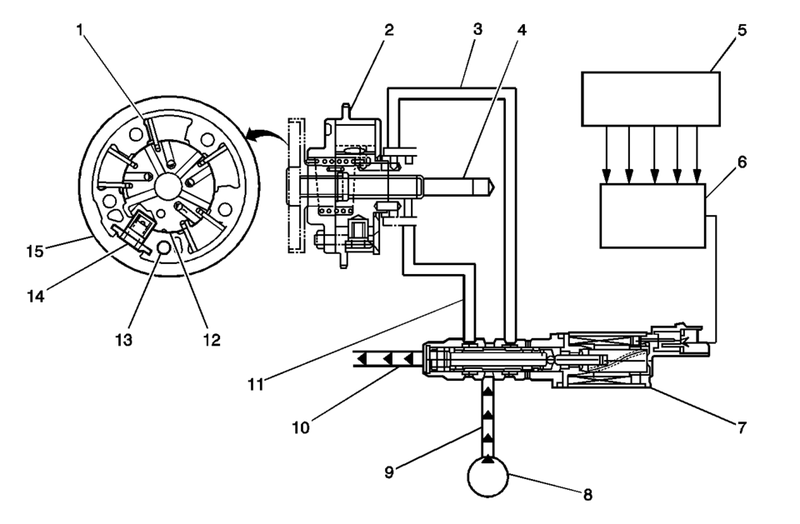 If a condition exists in either the intake or exhaust camshaft actuator system, the opposite bank, intake or exhaust, camshaft actuator will default to 0 crankshaft degrees.